My recent interview with Jonathan Wai, Ph.D. in Psychology Today outlines 9 ways to improve your child’s chances for success. The article has inspired much discussion online. What do you think of my “success” list below? Share your comments and join the conversation. 1. The crib as a metaphor for raising a child: kids need boundaries so they can have guidance but also freedom. 3. Realize that your child may not be just like you, and that can be a good thing. First-time dad learns how not to be the kind of parent he fears becoming. I started thinking about the nature of toddlers and their stuff, and I’ve been mulling over a few issues ever since. The first has to do with spoiling. I know that you can’t really spoil a baby—infants’ needs must be met. But am I developing habits of indulgence now that will ossify over time and lead me to spoil Luke when he’s older? Am I setting myself up to be a bad parent? The second issue has to do with the presents themselves, the catalyst of my spoiling concern: there must be a better use for all that money. 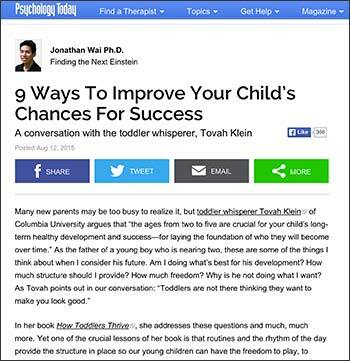 Tovah P. Klein, “The Toddler Whisperer”, on Good Morning America offering advice on how to best raise your children.